I'd like to know the manufacturer (and model, if available) of these pedals, but they only show "04 78" and "made in france." I couldn't find 'em on velobase. Do the dust caps give a clue? I overhauled 'em. Fortunately the lock washers held up, but one's key was almost toast. Whew! Last edited by SurferRosa; 04-14-19 at 03:30 PM. Those are awesome, seen em before but don't know what. If not for the dust caps, I would think they were Atom 600, although I suppose it could always be a version without the Atom 600 decals on the dust caps. I think they are French Lyotard. I'm no french expert, but my '78 Peugeot PR10 came with those. 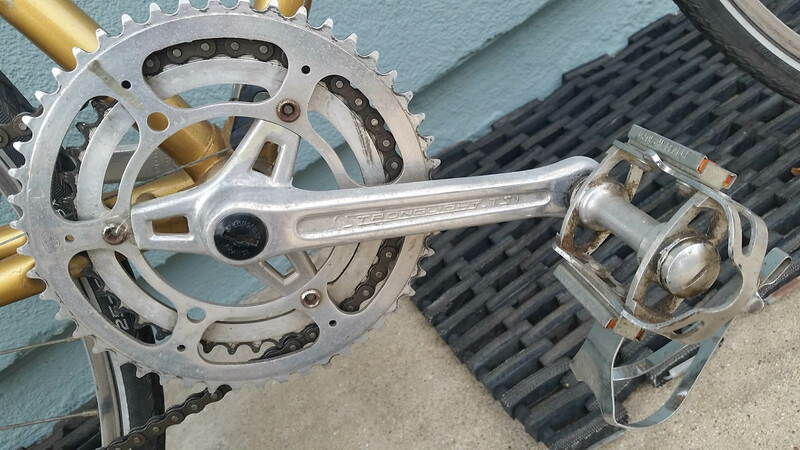 One was jammed and wouldn't rotate, and the crank pedal thread was stripped, so I removed them, replaced by Sugino crank and SPDs. They look just like those. Here's the best picture I have. '78 Peugeot brochure says Lyotard 36 RCM. Last edited by Slightspeed; 04-14-19 at 08:27 PM. Except for the dust caps these pedals are the same as the Maillard 700 pedals on my 1977 Peugeot PY-10. The machining of the parts is identical. The dust caps on my pedals have flats for a wrench and no screwdriver slot. My bike also has a Stronglight crank, but not the same one you have. 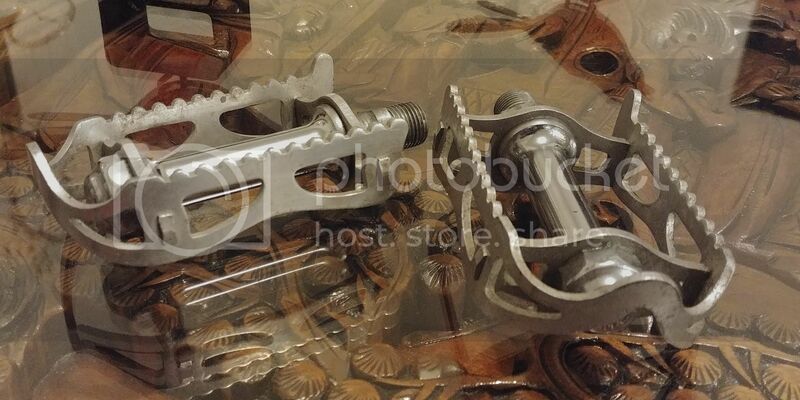 NOt that they will also have french threads and standard English thread pedals are slightly different. So I would say they are french. Except for the dust caps these pedals are the same as the Maillard 700 pedals on my 1977 Peugeot PY-10. The machining of the parts is identical. Have a set of Maillard 700's with black alloy cages. The dustcaps are marked GALLI. Evidently Maillard was the pedal provider for the Giovanni Galli S.p.A. road ensembles. As was posted previously, and I agree, they look like old Lyotards to me also. What model do you think they are? Model? I have no idea. I'm going off of 40+ year old memory from my bike shop days. Google Lyotard and Maillard quill pedals and then look at the images. 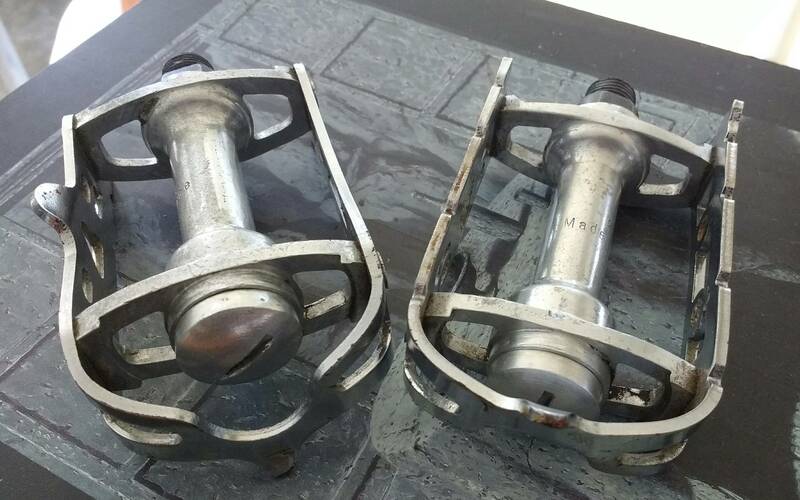 Last of the top line Lyotard 45CA pedals look like this, circa 1970ish.